In which I am barked at by two authority figures within one hour, decide that Philadelphia needs a new slogan, am educated by the National Park Service, and observe some ostentatious pimp fashion. And then realize that "ostentatious pimp fashion" is redundant. Philadelphia keeps going on about "The City of Brotherly Love", but that's just an explanation of the Greek etymology of the city's name. Sort of like Indianapolis calling itself "The City of Indians (Although We Long Ago Drove Away Those We Hadn't Killed)". A better motto for Philadelphia would be "SIT down, SHUT up, do NOT take ANY pictures of ANYTHING, and GIMME SOME MONEY!". That's not very warm and inviting as slogans go, but it would be more appropriate. The authority figures endlessly scold you for the least of reasons. The city is plagued by tireless hordes of vicious looking panhandlers making the city Cairo Upon the Delaware. Baksheesh demands that are aggressive to the point of harassment are just fine with the local authorities, what really sets them off is photography of roadways and violation of arcane and unannounced bus rules. 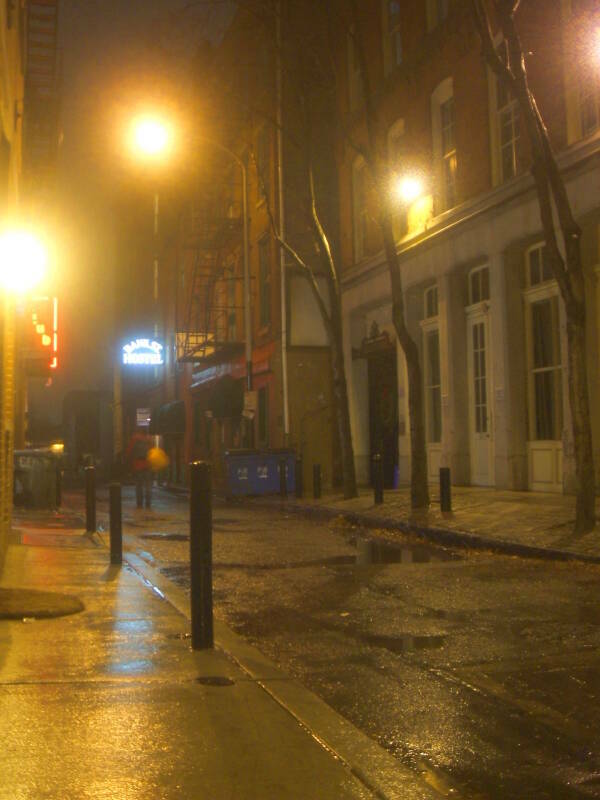 I was staying at the Bank Street Hostel, a nice place to stay in a narrow alley in the oldest part of the city between the "historic district" and the waterfront. Have you clicked on one of those buttons yet? Among other activities in Philadelphia, I walked across the Benjamin Franklin suspension bridge over the Delaware River. Nerdy engineer tourism, just look at that massive (and rather rusty) iron structure. There's a wide walkway above and to the side of the traffic lanes. Strangely, there was a Jeep parked part-way to the first tower. Why a Jeep? It's a place for the policeman to sit so he can snarl at any passing tourists: "Do NOT take ANY photographs of the bridge!" "Uh, okay", as I decided to interpret that as not taking any MORE pictures of the bridge. "Can I take pictures FROM the bridge?" "Yes, but NO photography of the bridge! DO NOT TAKE PICTURES OF THE BRIDGE!!" I resisted the urge to ask him what I should do about the postcard in my shirt pocket. The postcard with a traitorous full-color and detailed photograph showing structural details of this very bridge. Not taken from a distance, but from the very walkway I was on, showing some of the cable attachment points. And printed, according to the logo on the back, by treacherous foreigners in Thailand. I had purchased it in a drugstore along Market Street, the main street through the center of Philadelphia. Somehow the all-seeing eye of Homeland Security has not yet detected this subversive provision of sensitive information to anyone with 25 cents. Or to anyone who happens to think of asking eBay: "suspension bridge postcard"
Worse yet, I had also taken a number of pictures of the main post office in Philadelphia, with its WPA-produced Depression-era carvings in the surprisingly Soviet looking Muscular Socialist style. And earlier in the trip, some railroad stations and trains. Photography of post offices and roads and railways! This is the very sort of sensitive installations you are warned against photographing when you visit paranoid police states like Syria and Cuba and the Congo and, apparently, Philadelphia. As I walked on he took one last opportunity to snarl, "NO PHOTOGRAPHY!" Somewhere in Pakistan, or possibly Riyahd, Osama bin Ladin giggled as he thought about what he has duped us into doing to ourselves. So, partly to protest tyranny and ignorance, and partly out of spite, I took a few more pictures of the bridge once I was further onto the bridge and out of the cranky policeman's sight. I think Ben would have understood my photography. And wept a little at the police state atmosphere. This shot is similar to what you can buy in bulk at the drug store, on postcards printed in Thailand by actual Thai people who the U.S. Government suspects may be foreigners. The difference is that those $0.25 postcards do a far better job of showing crucial details. The mass produced postcards show the cable attachments in some detail. I was digging through my change to get the exact fare as we rolled away from the stop. The driver snapped at me to hurry up and pay because she might need to stop at any moment to pick up another passenger. This was as we were entering a mile-and-a-half long suspension bridge with no stopping lane and nowhere for pedestrians to stand and wait mid-bridge for a bus. But what do I know about driving buses? I paid as fast as I could. Luckily we did not have to stop in the middle of the bridge to pick up any passengers. Once off the other end, I pulled the cable for a stop. She looked up in the mirror and snapped "Who rang the bell?!" The only other passengers were two guys who looked like the sort who scrape together pennies and nickles for a fare and then ride the bus all day to get out of the weather. It gave them a break from pestering everyone for baksheesh. So I confessed, "I did." "Uh, I want to get off." And I was rapidly wanting more and more to do so, although I didn't add that. But really, why would a bus driver ask why you rang the bell for a stop? "Why? Where are you trying to go?" "To Poe's house." Yes, Edgar Allen Poe had also lived in Philadelphia, and Poe had become a minor theme for this trip through Washington DC, Baltimore, Philadelphia and New York. 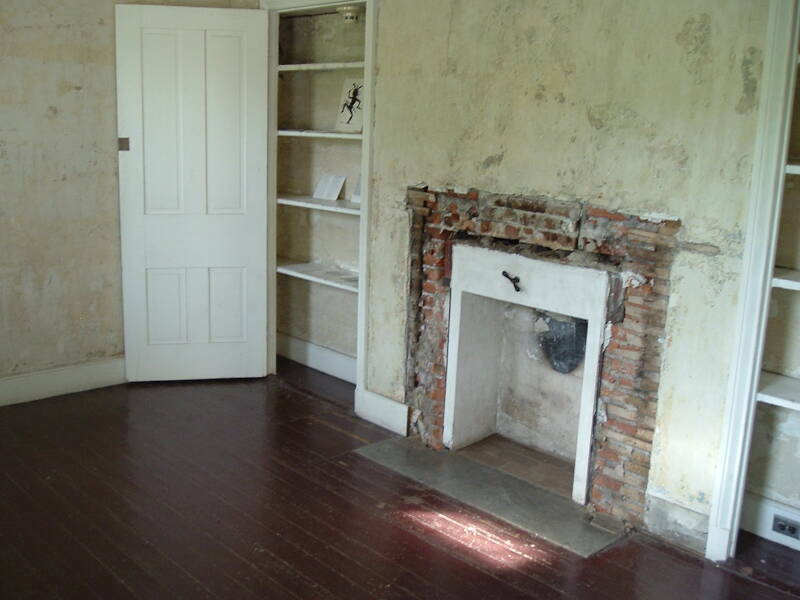 The National Park Service has restored his house, and it is a relatively well-known attraction. Well, assuming you know any attractions, that is. I suppose that cultural and historical awareness isn't really a requirement for driving a bus, but this was surprising. And just where do you start and how far do you go trying to answer a question like this? "Uh, he wrote a lot of short stories and poems. His house is just a few blocks north of here, it's a National Park site." I resisted the urge to explain that his writings were printed in things called "books" and perhaps she had heard of them even if she had never seen one. "This bus is going toward Market Street!" "Well, yes, that's why I want to get off. Poe's house is behind us now that we turned that last corner. The further I ride, the further it is to walk back." She gave me a dirty look and muttered something about stopping as soon as there was a good place to do so. Trying to follow the rules meticulously so as to avoid further scolding, I moved toward the rear door. She saw me moving back and shouted "HEY!!! GET AWAY FROM THAT DOOR!! WHAT ARE YOU DOING?!" I meekly shuffled back toward the front of the bus, bowing and scraping and apologizing that most bus systems ask you to exit through the rear doors in order to keep the front door clear for boarding passengers. She had already demonstrated an unusual sensitivity on the topic of possible boarding passengers. "NOT THESE BUSES! WE LOCK THE BACK DOORS SHUT! YOU GET OFF THIS BUS BY THE FRONT DOOR!" I was VERY happy to get off that bus. So maybe the Philadelphia motto should be, "WE LOCK ALL OUR CITY BUS REAR DOORS!! So SIT down, SHUT up, do NOT take ANY pictures of ANYTHING, and GIMME SOME MONEY!" After escaping the clutches of Angry Bus Driver Lady, I saw Poe's house. It's in a pretty rough neighborhood, maybe as scary as the setting of one of his stories. That means that its setting is MUCH nicer than his home in Baltimore. 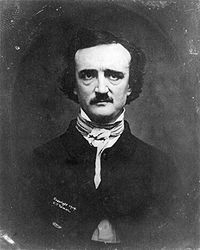 You can go down in the basement where it's thought that Poe wrote The Black Cat, a classic story of unpleasant events in a basement. Seeing the basement inspires thoughts of luring Angry Bus Driver Lady and Paranoid Bridge Policeman into the basement and bricking them into an unused passageway. I don't think either would know what a cask of Amontillado would be, so I would just promise them plenty of cheap booze. 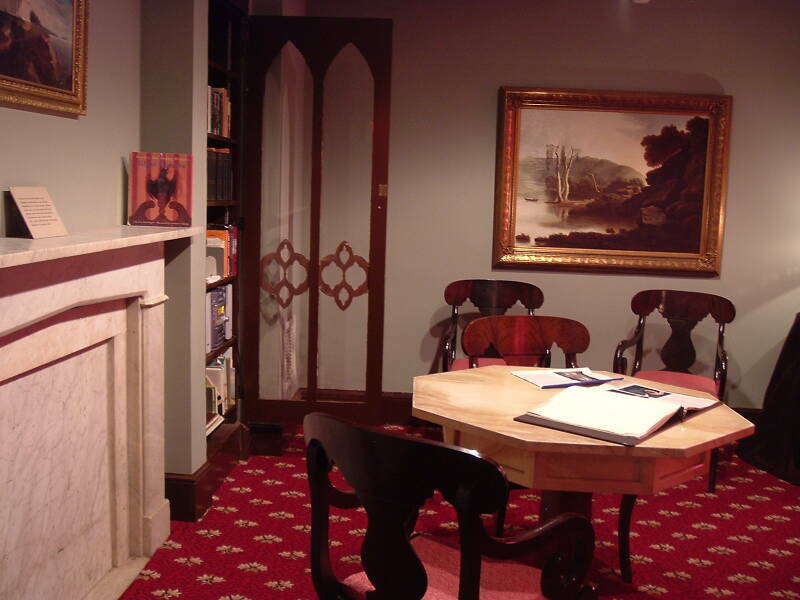 There's also a reading room built to the specifications of Poe's essay The Philosophy of Furniture. The Ben Franklin post office is an operating post office today. It's where he was US Postmaster General back in the day. There is a museum upstairs. The museum itself belongs in a museum, as it very obviously was put together in 1982 and hasn't been changed since. Lots of displays about how the US now has this new thing called a "Space Shuttle", and look, here are some stamps commemorating its very recent first flight. From there I went to the underground Ben Franklin museum, which just as obviously is a time capsule from about 1976. Very Bicentennial. Something inexplicable about the fonts and the technology used for the displays themselves made me want to don an avocado polyester leisure suit and grow out my sideburns. But it does have some interesting exhibits. And from there, to the Ben Franklin print shop. I was expecting maybe a 1968 motif with incense and Jefferson Airplane music wafting through the air. Maybe we'll see how Ben would have printed those distinctive psychedelic Grateful Dead concert posters? No, strangely enough it didn't seem to be the 1750s wrapped in more recent anachronism. It was just a good reconstruction and explanation of 18th century printing technology. Out along Market Street where Angry Bus Driver Lady wanted me to go, there is a new exhibit under construction in the large lawn in front of Independence Hall and the Liberty Bell exhibit building. 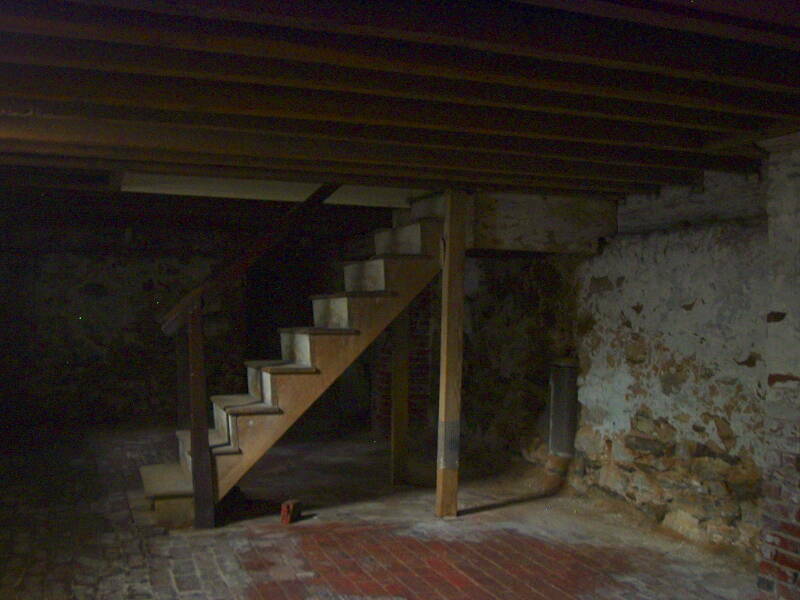 Some recent excavation has uncovered remains of a home where George Washington lived for a short while. One of the most prominent evil white slave-owners was George Washington. He wasn't just a tall wooden-toothed freak, he was also an especially cruel slave owner. Now that the evil slave-owners in the U.S.A. have reluctantly given up their slaves, slavery no longer exists, hooray! Although we do need to continue thinking about just how evil it was and who perpetrated it. Several hundreds of thousands of people currently enslaved across sub-Saharan Africa, owned and mistreated by other Africans, would disagree with the third point. And as for the second point, I had just come from Baltimore where the National Museum of Dentistry had some of evil white slave-owner George Washington's false teeth. They weren't wooden. They were made of ivory stained and cracked so that they LOOKED wooden. As if that's any better. Anyway, I read the explanatory placards, each of which used the term "enslaved Africans" at least six times. I did not slap my forehead and say, "Gosh, I just now realized that slavery was a Very Bad Thing!" Maybe I was supposed to, but I seem to have already known that from somewhere. I guess the park service is trying to educate someone. I suppose this might have been what Angry Bus Driver Lady was trying to steer me toward instead of that fancy-pants book-writer house. I walked around Independence Hall, symbol of freedom but now completely enclosed by crudely assembled metal fencing festooned with "KEEP OUT" signs and patrolled by scowling guards. Maybe it should be re-named Irony Hall. Or the Hall of Fear. I tried to frame my pictures to capture the irony. One of the guards seemed to sense what I was up to, or maybe they scowl especially hard at everyone daring to take photographs. Photography is nothing but pre-attack surveillance. What else? Yet another art museum. When Sylvester Stallone made one of the "Rocky" movies, the one where his fictional character has a statue made in his honor, he commissioned a real statue of himself instead of a fiberglass movie prop. Then he insisted that the city should display this combined homage-to-Stallone and movie advertisement at their world-class art museum. To Stallone's great surprise, they refused. This hasn't kept him and his minions from agitating for it to be done, apparently his fans STILL pester the art museum to display it there. Meanwhile, the collection of real art is very nice. Also, a department store where W.C. Fields once worked. Well, of course, this being central Philadelphia, it's a huge boarded-up FORMER department store. But W.C. Fields working at a department store, ideally in the customer complaints office — that sounds like a premise for a funny W.C. Fields movie. To be shown as a double feature with one about a hardware store staffed by the Three Stooges. On my way to the bus station to leave Philadelphia I passed what can only be described as Santa Pimp. And just where would a department store Santa Pimp work, when the department stores seem to mostly be boarded up? 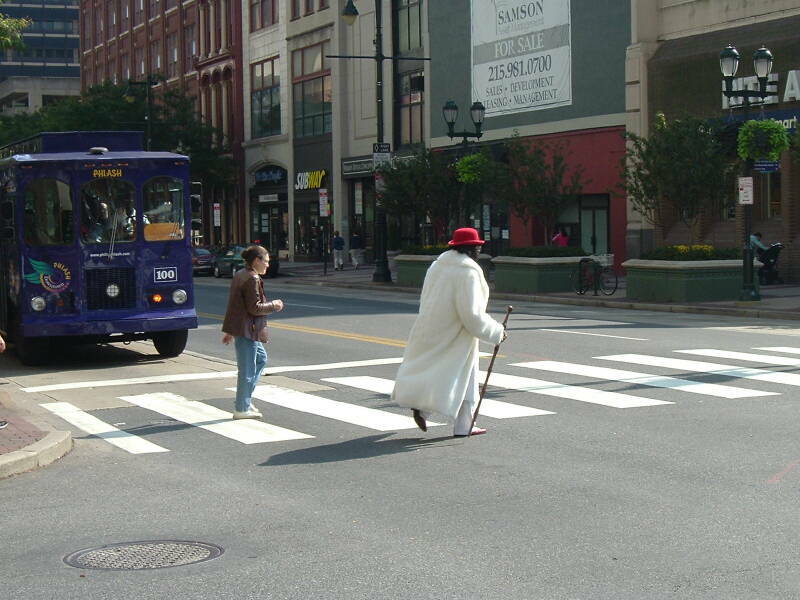 The next time I was in Philadelphia I saw another walking charicature of a pimp (and was able to get a photograph). 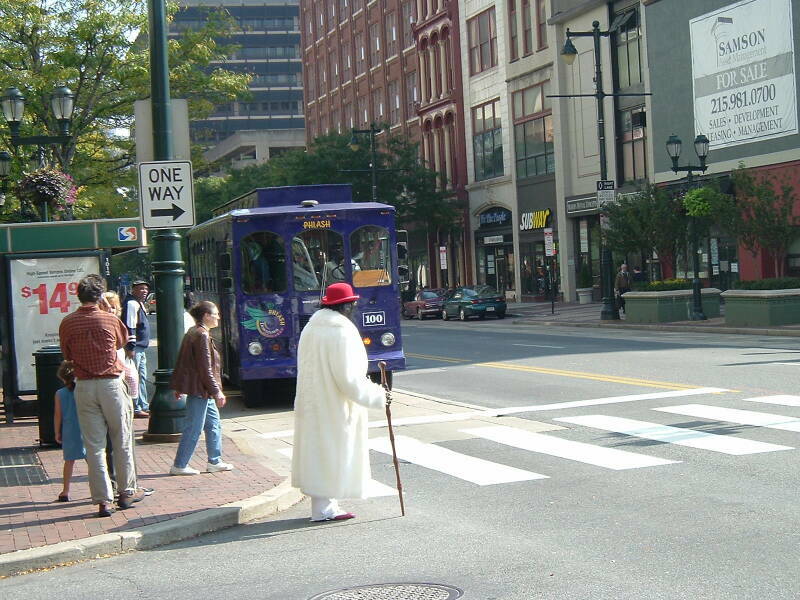 An ankle-length white fur coat (this was during warm weather, mind you) with a gold-knobbed walking stick and red velvet derby-style pimp hat. If you want to see extreme pimp fashion, Philadelphia seems to be the place to look. The Philadelphia-to-New-York travel segment was on a Chinatown Bus. The east coast has systems of Chinatown Buses, sort of a Sino-diesel Stargate system by which you can quickly and cheaply travel between arbitrary distant pairs of Chinatowns. The Chinatown bus office in Philadelphia is just around the block from the Greyhound station. I had checked prices and schedules at both. The Chinatown bus goes twice as often and costs half as much. But for some reason the Greyhound station has people standing in line to take the more expensive and less frequent service. Brand loyalty forged by fond memories of rides home from prison, I suppose. But for just $12 to the Chinatown bus company and 2.5 hours on the New Jersey Turnpike you can arrive in New York's Chinatown.